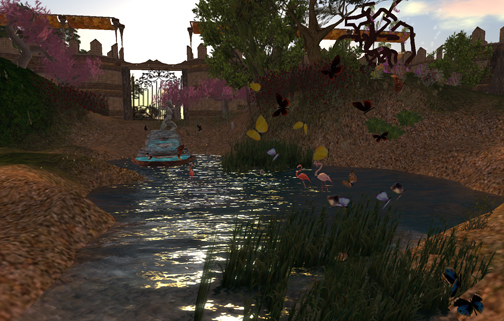 Niftiness in Second Life tm Shengri La…Free Horseback Riding! 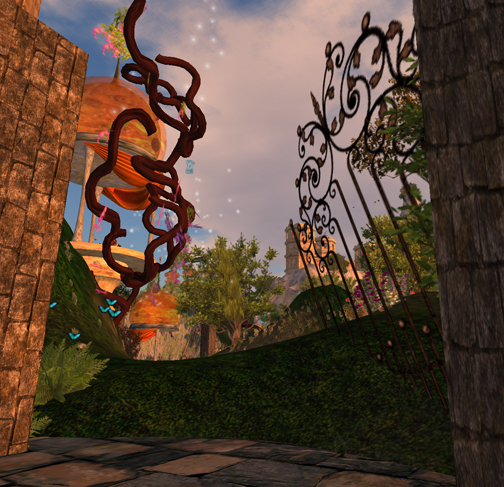 The Fashion Research Institute Shengri La complex in Second Life is the creation of many talented people working together to create a beautiful, peaceful, immersive experience. 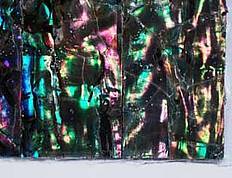 We all add and remove bits of it, and occasionally something will happen that proves to be transcendent. A perfect example of this is the new horse rezzer located earlier this week. The rezzer pops up a vehicle that is saddle shaped. Then it hands the rider a horse. The rider wears the horse from inventory, and suddenly the rider is mounted on a fully saddled horse, ready to go riding! This isn’t just any generic horse, either. The creator of this particular system put a lot of painstaking work into scripting and creating the actual horse. Through a menu system, you can change the saddle style on your horse, show or hide its Pegasus wings, change your riding pose (side saddle, anyone? ), change your gait, and even change the color of the blanket under the saddle. The horse itself will carry two people, so you can ride double. You can change gaits by moving through its programmed gaits (Walk, Canter, Gallop, Fly) by choosing page up or page down. What’s really fun about the horse you are given to ride is that the creator didn’t slack on the details – it blinks its eyes, switches its tail, wiggles its ears, stamps its foot when you are standing, whinnies, and sends up little puffs of dust when you are riding. The horse itself is a mixture of primwork and sculpted prims, and of course, it moves its legs when ridden. For those equestrians who love SL horses, this won’t sound terribly impressive – until you realize that you’ve just been given this horse from the rezzer…for free. As an estate owner, you can put the rezzer up, and allow visitors to your land to obtain the saddle vehicle and the horse (for free!! ), ride around your estate until they get tired, and when they dismount, the saddle poofs, and they get to keep the horse. The saddle won’t survive a teleport, but it does survice sim crossings quite nicely. Riders can’t ride the horse again unless they use the saddle rezzer again. Needless to say, I was enamored. The horse itself has some little quirkinesses to riding it – but for horse lovers or anyone who wants a fun, witty, immersive activity, a ride around Shengri La is enormous fun, as we found out last night. I was tweaking the new saddle rezzer arrangement in the Welcome Area when I noticed some people in Joy. So I flew over, and discovered Script Wizard Dale and Chestnut. In the process of telling them about the cool new horses we now have in Shengri La, I brought out a saddle rezzer. Another friend, Ahuva Heliosense, teleported in about then, and when she heard the word: horse, she took the plunge. Before I knew it, we had galloping Utopians all over the sim, and a few other friends joining us for the mayhem. It took a little tweaking to figure out the horses, but once we got it, everyone really enjoyed themselves, as you can see in the pictures below. 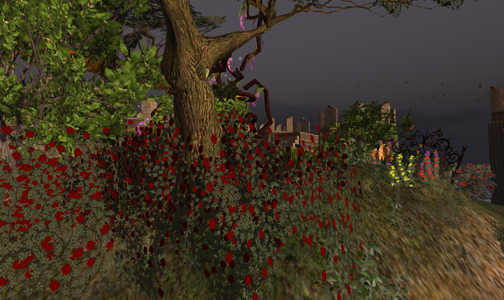 We finished our evening with an impromptu art show by Callipygian Christensen, who is working up her next gallery changes for her main gallery in Shengri La and a fireworks display by Script Wizard Dale, who wowed us with some fancy and fanciful particle fireworks. 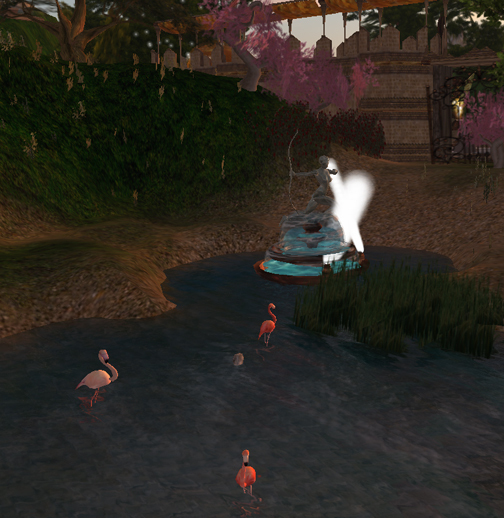 If you haven’t visited Shengri La in SL yet, please consider yourself invited. The horses are now there for anyone to ride. Instructions are included in the information kiosk right behind the saddle rezzer. Ahuva Heliosense discovers her wings!